Tag Archive | "Dojo Loach (Misgurnus anguillicaudatus)"
The Dojo Loach (Misgurnus anguillicaudatus) is also known as the Weather Loach, Oriental weatherfish, Chinese Weatherfish and Pond Loach. These remarkable fish are called Weather Loaches or Weatherfish because of their habit of becoming extremely active when there is a change in the weather, possiblly due to barometric pressure changes. Dojo Loaches are bottom dwelling scavengers that are found in the Lakes, Rivers, Ponds and rice paddies of China, Korea, and Japan where they are now pond raised for the aquarium trade. 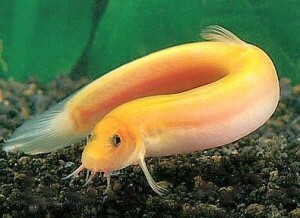 loach is available in both its wild form and in a gold variety called the Golden Dojo Loach. The wild form of the Dojo Loach has dark greenish gray to dark brown spots over a yellowish brown, often mottled body and a noticeably paler belly. The Golden Dojo Loach has a much thinner body and is pink to gold in coloration. Both forms of Dojo Loach are peaceful and very efficient scavengers that make a welcome addition to any community aquarium. They normally will not bother other fish in the aquarium and are one tropical fish species than can be kept with fancy goldfish to help clean the bottom of the tank. Dojo Loaches wiggle about in an eel like fashion scavenging the bottom for leftover bits of food and even munching on snails. 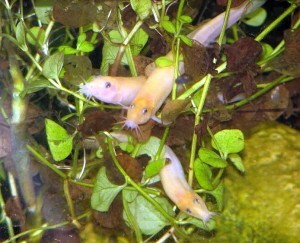 Dojo Loaches do well in potted plant aquariums with a soft sand or fine gravel substrate. They enjoy digging and burrowing into the substrate and will eventually uproot unpotted plants. They are most active during the evening hours and like to hide during the day in rocks, caves and around driftwood . In addition to being very playful, Dojo Loaches have some very unique qualities. They can be trained to take food from your hand and enjoy being touched. Since Dojo Loaches can be jumpers, you should have a tight fitting top on your tank, however, if they do jump out, they can survive out of water for quite some time. They produce a thick mucus coating that keeps their body moist and are able to swallow air by absorbing atmospheric oxygen through their hind gut. This loach is an easy to care for species that requires a 30 gallon or larger tank, a good filter for the detritus they stir up, plenty of hiding places and a water temperature between 68 and 76 degrees F.
The Dojo Loach is primarily carnivorous. They prefer freeze-dried bloodworms , tubifex , chopped worms, and other frozen or live meaty foods. They are also fond of snails and will quickly rid your tank of an infestation. Tropical fish keeping enthusiasts should use caution when housing Dojo Loaches with small invertebrates such as Ghost shrimp or Japonica Amano Shrimp . The Dojo Loach is common and available for purchase between 2″ to 4″in length.